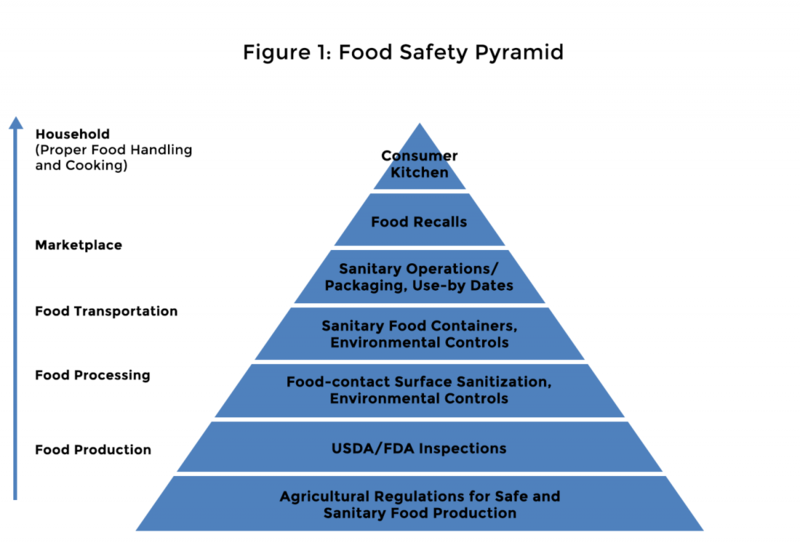 The U.S. food supply is among the safest in the world, thanks to a multitude of protective measures all along the path from “the farm to the fork.” Many of these measures are illustrated in the Food Safety Pyramid in Figure 1. One of these, food recalls, helps warn consumers when contaminated food has made its way into the marketplace. According to the US Food and Drug Administration (FDA), recalls are implemented when food products are known to be mislabeled or present a health hazard to consumers. Recently, a 24/7 Wall St. article reported on the “29 Food Recalls that Poisoned the Most People.1” We examined the data on these recalls to arrive at the following conclusions. Figure 2 demonstrates that of the 29 food recalls that “poisoned” the most people in the U.S. between 1985 and 2017, the highest number of recalls, 11, was of vegetable, fruit, or nut products. 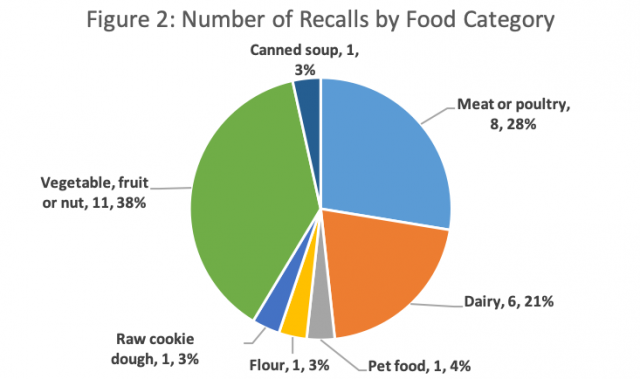 There were eight recalls of meat or poultry products, six of dairy products, and one recall each of flour, raw cookie dough, canned soup, and pet food (in which pets, not people, were affected). These findings are roughly consistent with those of a large CDC study that we wrote about in 2015 that matched foodborne illnesses to food categories and determined the majority of foodborne illnesses between 1998 and 2008 were due to fresh produce (46%), followed by meat and poultry (22%). 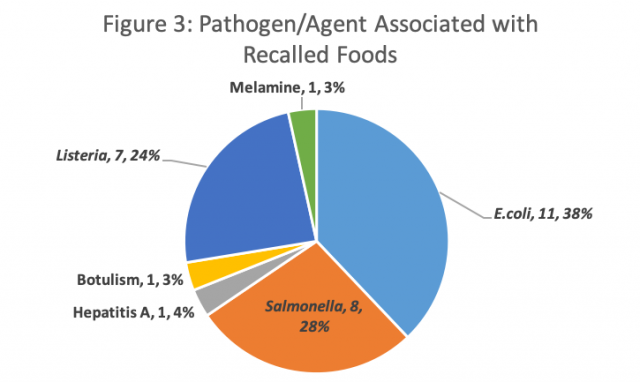 Figure 3 shows most food recalls (11) between 1985 and 2017 were associated with E. coli bacterial contamination, followed by Salmonella (eight) and Listeria (seven). Notably, E.coli was the reported culprit in over 565 cases of illness due to contaminated meat products in four reported outbreaks. E. coli was also implicated in seven other outbreaks, resulting in over 384 cases of illness due to contaminated vegetable and fruit products, including spinach, raw cookie dough, unpasteurized apple juice, raw flour, soy nut butter and celery and onion mix. 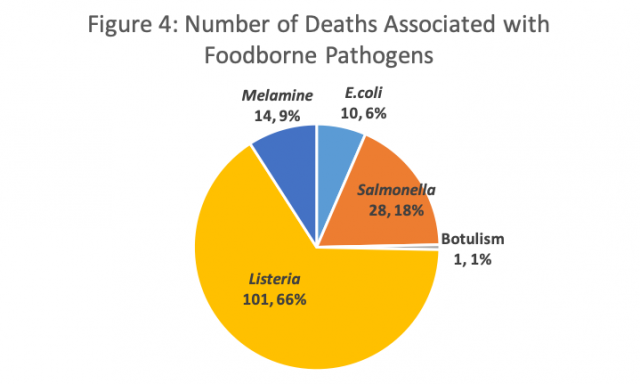 Figure 4 indicates Listeria deaths (101) were more numerous than deaths from any other pathogen in the period 1985-2017. Salmonella took the lives of 28, followed by melamine (14), E.coli (10), and Botulism (1). The data show Listeria, implicated in about one quarter of recalls, was responsible for the greatest number of recall-related deaths. Salmonella, associated with just over one quarter of recalls, sickened a large number of people. E. coli, implicated in the highest number of recalls (nearly 40%), was responsible for only a small number of recall-related deaths. U.S. consumers have good reason to be confident in the overall safety of our food supply. That said, from time to time, contaminated food products “slip through the cracks” and arrive in the marketplace. As we’ve shown, the deadliest outbreaks may not be those that sicken the greatest number of consumers. Food recalls are widely reported in the media, on FoodSafety.gov and on the website of the small, national nonprofit public health organization www.stopfoodborneillness.org. It’s up to all of us to stay alert for food recalls of all types to help avoid rare but potentially deadly foodborne illness. Bruce K. Bernard, PhD, FATS, RAC is President of SRA Consulting, Inc., Associate Editor of the International Journal of Toxicology, and a member of the Water Quality & Health Council. 1The 24/7 Wall St. article title is a bit misleading as it includes a major outbreak from tainted pet food that killed cats and dogs.